Aesop wrote, "appearances are often deceiving," and we all know that as well. For instance, aging. Ever wondered why age-defying products nowadays stand in equal footing with basic grocery staples in terms of sales? We want to look young... forever if we could. But life will always find a way. Thus, age is the unstoppable force we all must face, everyday. Even now, I still don't get it why some of us, especially women just can't readily admit our age. Like it's a "disease". I think the underlying issue here is an inner conflict between two choices. 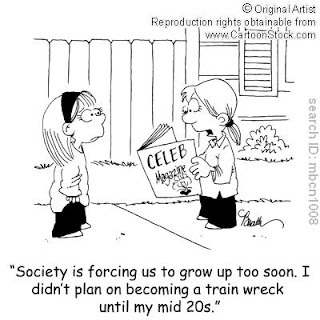 To be acceptable or to be a willing victim of societal expectations. Either way, we're trapped. Perhaps we need to be be reminded that "growing old" doesn't always mean "growing up" for most of us. There's a peter pan beneath us all. A child within. Our sense of "fun". There's a huge difference between being child-like and being childish. The child-like attitude is trusting, have simple wants, and easily pleased. But childishness have misplaced ideals, vanity, discontent. And it reeks selfishness. It's a very thin line we all cross too often. Why? Misplaced ideals. It's the basic rule of consumerism. We willingly watch it being forced down our throats everyday. Ideals like instant wealth, success, fame, vanity, permissiveness. We've consented to advertising glorifying promiscuity as modern art —pornographic art. We promote materialism with the red-tag label of success and self-respect. We've reasoned out perversion as "forward thinking". What's next? Politics to replace religion? Your bet is as good as mine. Vanity. Shopping malls have trained us to want more, then want even more. I remember one time, my best friend and I chanced upon a sale event by one flip-flop store at SM-Cebu. Crowds flocked to the store almost like panic-buying while the other store salespeople drooled at the long lines of customers cashing in on pairs of overpriced flip-flops. Then we overheard from a few bystanders witnessing the spectacle, "Sus, mahala ana tsinelas ah, unya tumban ra." (Jesus! Those flip-flops cost too much for something just to step on.) And I had a pair then. Buh. Discontent. I remember coming home late one night. I picked a window-side seat in the hire-van to secure a little privacy for myself during the long ride. Then, a guy, fidgeting with his TV-phone slumped next to me. I felt a tad intruded. Not that I disliked the guy for any reason, but, what really bothered me was the fact people would actually deem it necessary to carry the idiot box around. Not enough noise, yet? How about iMax goggles replacing RayBan?